The cost of college tuition and living expenses like room and board continues to rise. The increasing costs of college do not appear to be slowing down any time soon. Over the last 10 years private non-profit college tuition has increased 65% while their public school counterparts increased 104%. Last year alone public school tuition, on average, increased 4.8%. All of this leads to a larger percentage of students needing significant student loans to get through college. There are a wide array of loans available with different cost structures. Knowing the difference between different types of student loans can help you minimize the financial damage of going to college. The easiest way to think about student loans is to group them into categories based on whether or not the interest on the loans is subsidized; and,Â who can take out the loans. Subsidized loans are loans where your interest is paid for by another party for a period of time. When you take out a loan to pay for your first freshman semester the interest calculations on the borrowed amount start immediately; they don’t wait until you graduate. With a subsidized loan that interest while you are in school is paid on your behalf. With subsidized Stafford loans the federal government is the third party paying your interest while you are in school. The opposite is true with unsubsidized student loans. While you do not have to make payments on the principal or interest during your time in school (and a grace period after you graduate) the interest is not paid for by the federal government. From the moment you take out that first loan the interest accrues and is rolled into your loan principal amount. This leads to higher balances upon graduation. You might think that only the student can receive student loans in their name to pay for school, but this is untrue. 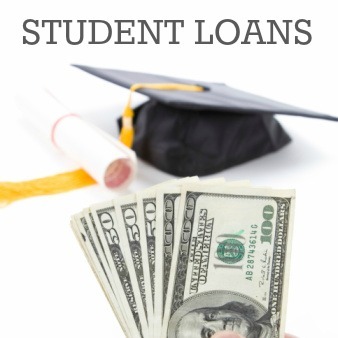 Some loans can be taken out by the student’s parents to assist in paying for college. Here is a comparison of the different student loans based on the above criteria. Require you to demonstrate financial need. Require you to remain enrolled at least half-time in an eligible degree or certification program. Require you to be a U.S. citizen or eligible non-citizen. Require you to begin making payments six months after graduation (or no longer qualifying due to dropping out or dropping below half-time enrollment). The six-month period post-graduation is called the grace period. You may request a deferment â€“ essentially asking to postpone when your payments begin. Subsidized loans will continue having the federal government paying your interest. You may request a forbearance â€“ however, interest will still accrue and capitalize (meaning added to your principal amount). Have a fixed interest rate of 6.8%. Loans typically must be repaid within 10 years but different payment plans are available. Do not require you to demonstrate financial need. There are limits based on your year of schooling: $3,500 for the first year, $4,500 for the second year, and $5,500 for all years after that. If you still have financial need you may borrow up to another $2,000 per year in unsubsidized funds. If you need additional funds and your parents do not qualify for PLUS loans, you may borrow to a maximum of $57,500 in Stafford loans. Require you to begin making payments six months after graduation (or no longer qualifying due to dropping out or dropping below half-time enrollment). The six month period post-graduation is called the grace period. Have a fixed interest rate of 6.8% (assuming you received the loans after July 1, 2012). Require you to demonstrate exceptionalÂ financial need. You may borrow $5,500 per year as an undergraduate to a total of $27,500. You may borrow $8,000 per year as a graduate student to a total of $60,000. Require you to begin making payments nine months after graduation (or no longer qualifying due to dropping out or dropping below half-time enrollment). The nine-month period post-graduation is called the grace period. Have a fixed interest rate of 5.0% (assuming you received the loans after July 1, 2012). Interest is paid by the federal government as long as you are currently enrolled, in a grace period, or in deferment. Loans typically must be repaid within 10 years; there are different payment plans available but they are limited. There are two types of PLUS loans: one for graduate students and one for parents of students. Loan eligibility is based on your credit worthiness as well as your enrollment in a degree program at least half-time. You can borrow up to the total cost of your education minus any other aid you receive. New Grad PLUS Loans moving forward have an interest rate of 7.9%. For loans funded after July 1, 2008 there is a six-month grace period before loans payments must begin. You may request a deferment or forbearance. Interest will accrue and capitalize during these periods. Loan eligibility on three factors: enrollment, credit worthiness, and being a parent, step-parent, or legal guardian of the student. Parents can borrow up to the total cost of attendance at the school minus any other aid the student receives. There is no borrowing limit. Borrowers have 10 years to repay the loans. The typical deferment and forbearance options are available. Parents have two options to begin paying back the loans: either before 60 days has passed once the loan is funded or six months after the student graduates, drops out, or falls below half-time enrollment. Unfortunately there aren’t any set options for private loans or loans provided through the school that are not backed by the federal government. That means interest rates, deferment and forbearance options, and loan terms are all dependent upon the lender. However, due to the rising cost of tuition some students or parents may need to take out private loans in order to pay for the college education they desire. Do you have student loans or are planning on getting them? Leave a comment and tell us what your plan is!